The characteristics and performance of a premium round without the high maintenance of the associated cost of said premium rounds. 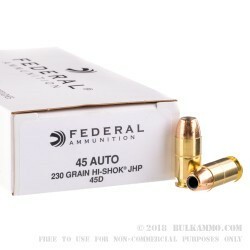 This Federal Premium 230 grain Hi-Shok projectile loaded ammunition gives hard hitting performance and an easy to feed, reliable loading that works in just about any firearm. The simple unassuming packaging doesn’t hint at the tiger beneath the paper packaging. This classic hard hitting round uses a proven bullet technology to ensure that for the money, very few other .230 grain loads can compete. 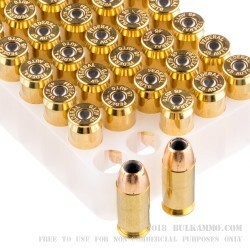 The rolling recoil is easy to control and the powder of this load is clean and through burning. 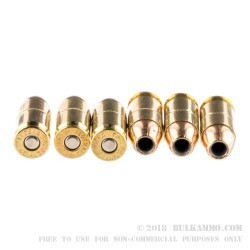 The Boxer primer and brass casing make it easily reloadable for the obvious value add. A large cavity with a proven to feed nose design means that even in the pickiest 1911, or new autos, this round will work exactly as it should. there’s something to be said for a round that works the first time you pick it up and that you have peace of mind that it will function intuitively like you will need to in a situation like self-defense. This round is a reliable performer without the frills or marketing speak. IT just works, the first time, every time. Q: what are the ballitics on this product? A: Hello Matt! 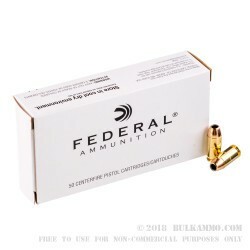 Federal lists the muzzle velocity of this round at 850 fps with a muzzle energy of 369 ft. lbs.